Maximalism is the beacon of hope for those who crave to have their personalities shine through and emphasize their varying interests within their home. It’s official… more is more. Say goodbye to muted colors, clean lines and unassuming furniture. The time of Trump is upon us, and whether or not our President has anything to do with the lurking shift in design trend, our country is on the precipice of a change from minimalism to maximalism. This emerging of the bold and vibrant is a Renaissance of sorts, although I am not quite ready to swallow the pill of ornate carved wood in gilded gold just yet. It is my opinion that the general population is over having their homes look just like everyone else’s with low plumb lines, monotone color schemes and the aesthetic restraint that comes along with minimalism. Maximalism is the beacon of hope for those who crave to have their personalities shine through and emphasize their varying interests within their home. However, do beware. Maximalism is trickier than most trends and requires skill to create elaborate looks without looking like an identity crisis. Here are some tips to help guide you through. Tell a story. Allow the furnishings and collections of accoutrements you have acquired over time weave a story in your space. Create collections of collections and mix your artwork even if it doesn’t necessarily match. It’s about layering, not matching. Art is where it’s at for a maxed-out space. Create floor to ceiling gallery walls of photographs, children’s artwork, posters and your favorite paintings. Be bold. Just as the Trump aesthetic is far from subtle, the same goes for your decor. Say goodbye to chalkboard paints and hello to high gloss walls in vibrant hues. Saturation and luxe is the name of the game and can be won by layering clashing patterns, incorporating loud wallpapers and load up on cozy fabrics, throws and pillows. (Here a touch of Hygge design comes into play.) When in doubt layer, repeat, repeat, repeat… and repeat some more. Keep symmetry. Bold colors and never-ending layers can lead to chaos if not controlled in some way. Maintaining symmetry and organization reduces the chance for over stimulating the mind and prevents maximalist design from looking like one big mess. Another bit of advice– superimpose multiple shades of the same color to generate richness without feeling like Rainbow Brite moved into your house. 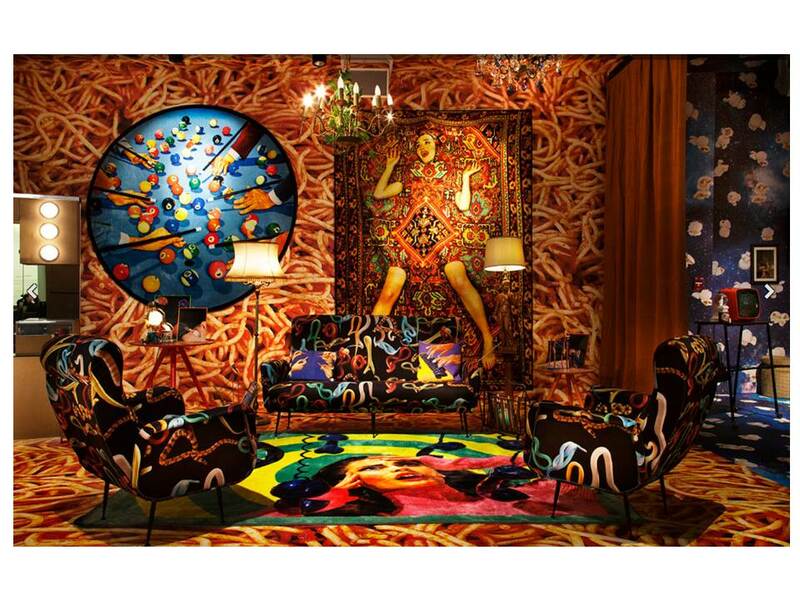 Maximalism is not for the faint of heart and can be rather overwhelming for some. My recommendation would be to test it in a small space like a powder room, office or guest room before moving into larger living spaces. Here’s to you maxinistas… If you’ve got it, flaunt it!